A sublime combination of pure plant oils means that essential Omegas 3, 6 and 9 unite in a ratio that your skin recognises and easily absorbs. An excellent dose of Vitamins A, C and E provides the ultimate daily nutritional skin boost. Immerse your spirit in the jubilant aroma inspired by exotic feijoa and wild blackcurrant. Aqua (water), glycerin, Persea gratissima (avocado) oil, Limnanthes alba (meadowfoam) oil, Ribes nigrum (blackcurrant) oil, wheat straw glycosides, cetearyl alcohol, Actinidia chinensis (kiwifruit seed) oil, Feijoa sellowiana (feijoa) extract, gluconolactone, sodium benzoate, calcium gluconate, essential oil fragrances of feijoa, blackcurrant and fig: citral+, citronellol+, d-Limonene+, eugenol+, geraniol+, linalool+. + Component of essential oil. Apply generously to your hands and body to relieve excessive dryness. Below are reviews of Antipodes Jubilation Hand & Body Cream - 120ml by bodykind customers. If you have tried this product we'd love to hear what you think so please leave a review. I love the smell of this product. 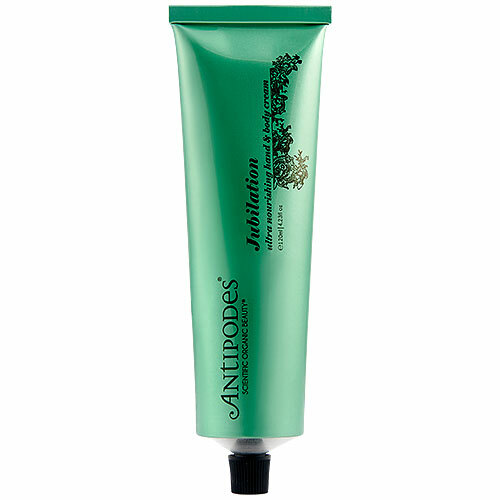 It is also a fabulous moisturiser leaving my skin smooth and nourished. A sublime combination of pure plant oils means that essential Omegas 3, 6 and 9 unite in a ratio that your skin recognises and easily absorbs.